My sister wanted a 1960’s theme for her birthday bash – music, decorations, clothing and yes, food. As we collaborated on the menu, Janet loaned me a couple of old cookbooks for inspiration. I paged through many recipes when the idea struck. 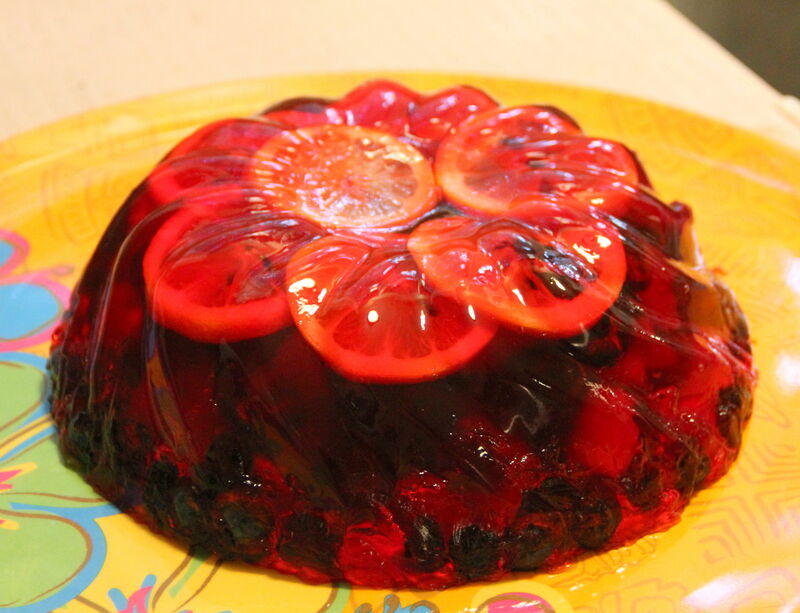 A Jello mold! Sadly, ingredients such as raw egg, cream cheese, canned fruit and other oddities didn’t feel right. So I followed one of my favorite bits of cooking wisdom – when in doubt, add booze. 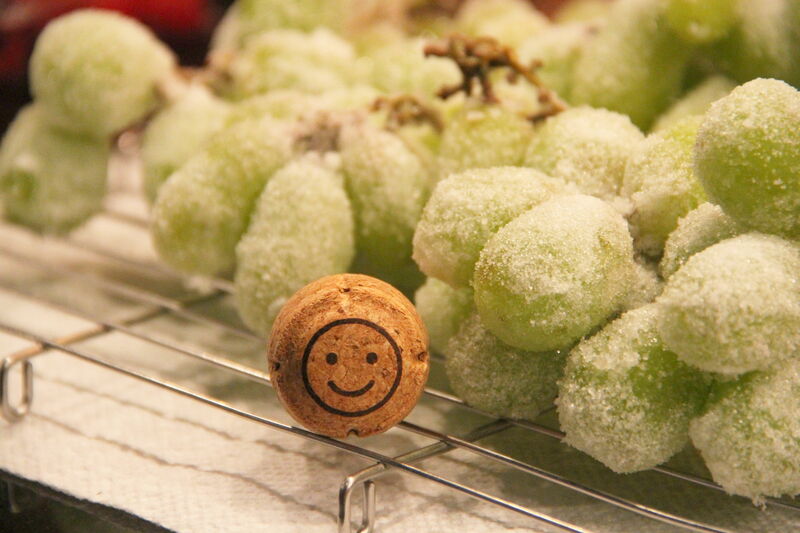 I knew I was on track when I peeled the foil from the proseco bottle and spied the tiny smiley face printed on the cork. Lots of fresh fruit added a colorful, decorative touch, and the frosted grapes shimmered and sparkled in a perfect party-like manner. Janet couldn’t find her old jello mold, so I used one of my grandma’s old cake pans. Any pan will do, but be patient and let the jello set to just the right consistency for the fruit to “float”. 2 ½ hours was right for the size of my mold. Jammin’ and jiggly, our shimmery jello was an evening birthday party smash! And the next morning, who’s to say it wasn’t a real groovy breakfast in bed? 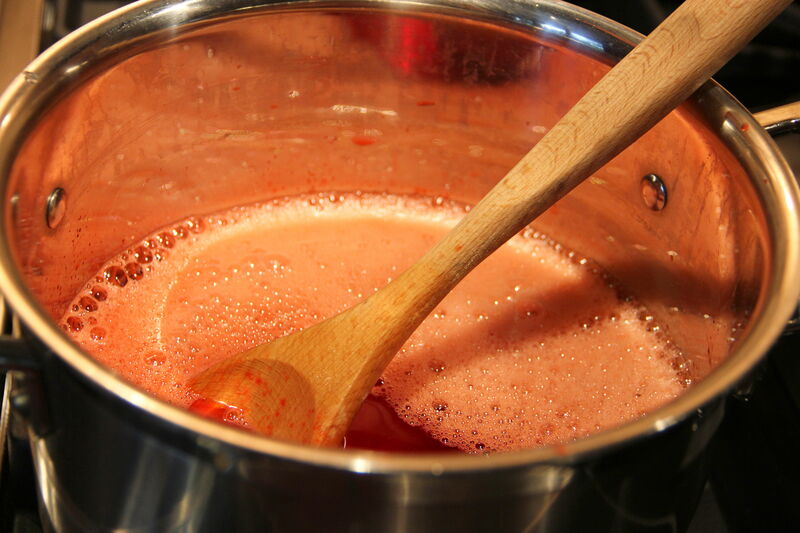 Pour water into a heavy, medium-sized pot and bring to a boil. Remove from heat. 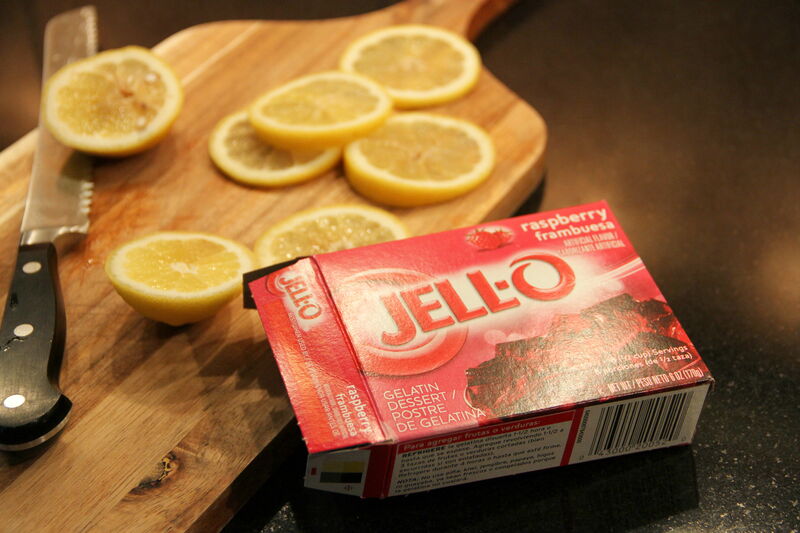 Pour in contents of Jell-o package and stir for 2 minutes, until completely clear and smooth. Stir in proseco. Pour mixture into mold and refrigerate until partially set, about 2 to 2 ½ hours. 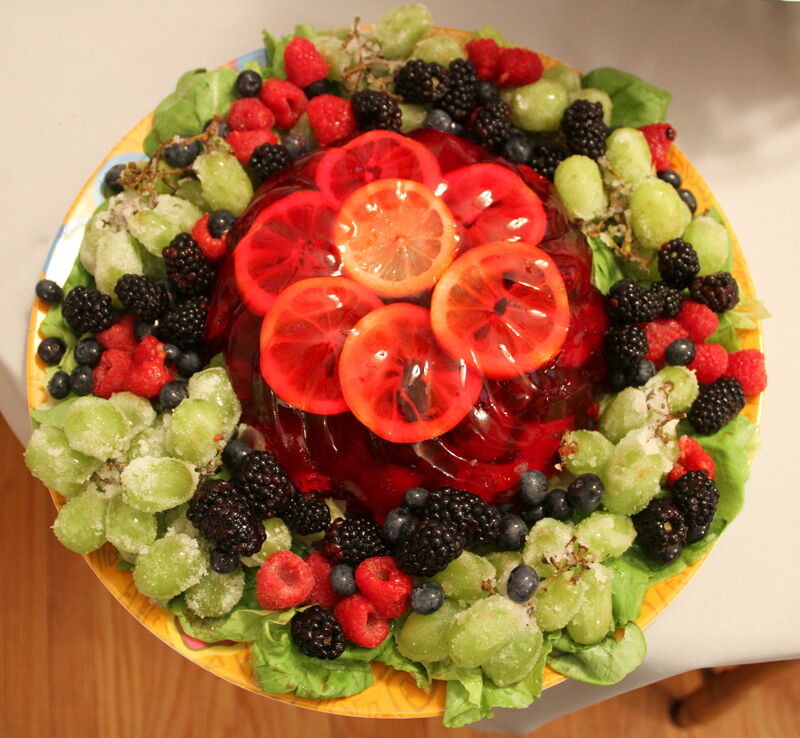 Texture should be firm enough that fruit will remain “floating” when immersed in the jello. Slice lemon into very thin rounds. Press lemon slices down and arrange in a pleasing pattern to cover the bottom of the mold. Add the blueberries and raspberries, pressing down to “float” throughout the mold. Return the mold to the refrigerator, and chill for at least another 2 hours, or better, overnight. When ready to serve, run a small, sharp knife blade around the rim of the jello to loosen. Then very briefly put the mold in warm water. Place a platter on top of the mold and carefully flip. Arrange lettuce leaves around mold, then garnish with Frosted Grapes and mixed berries. Serve immediately. Wash and trim grapes. Dip grapes into egg whites and shake off any excess amount. Dip and roll in sugar to cover fruit. Let dry on rack at least 2 hours before serving. Posted in Breakfast in Bed	| Tagged bed, bedroom, Breakfast in Bed, Breakfast Recipe, Charles P. Rogers, family, Jammin' Jello	| Comments Off on Breakfast in Bed: Jello? 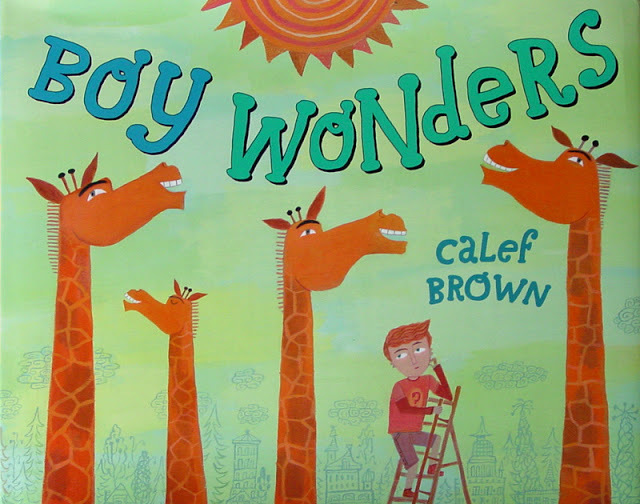 Boy Wonders by Calef Brown. The newest addition to our bookshelf is this collection of very silly poem things by author and illustrator Calef Brown. “Boy Wonders” is a series of queries on a number of subjects. I’m sure most of us don’t have answers to most or possibly any of his questions, but they are sure to elicit chuckles and perhaps a stream of inane questions in response. I’ll be honest with you: I’ve always liked Calef Brown’s poetry a lot more than his imagery. I find a lot of his pictures to be kind of creepy. It’s mostly the way he draws noses. That’s not the only thing, but that’s the most prominent thing that creeps me out. Fortunately, this is a pretty un-creepy collection. 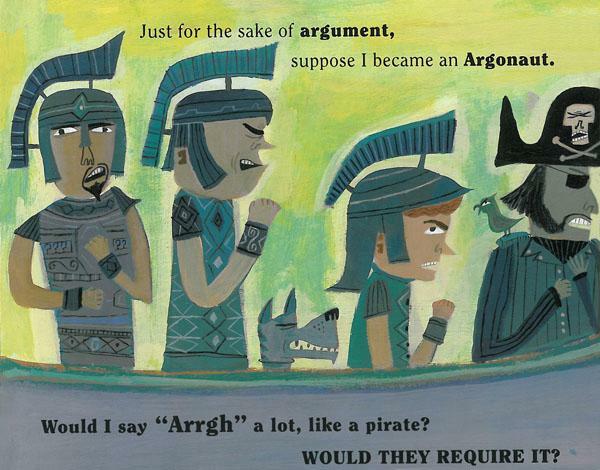 I’m proud to say my son has actually improved on this by changing it to: If I were an Argonaut, would I say “Argh”? Or not? Boy Wonders is a silly fun book for anyone who loves a ridiculous pun or play on words. So long as you aren’t scared of weird-looking noses. Greek mythology. It’s always so much fun to read. About the only time I did my homework in middle school was when I was assigned Edith Hamilton’s Mythology. I was supposed to read all the bits about the Odyssey, but I went ahead and read the whole thing. It has been much to my delight that my son loves the myths of olde as well. Argus, the watcher with a bunch of eyes? Not creepy to him in the least! He is fascinated by Medusa. How could you not be? I really hope he decides to name his first dog Cerberus. I don’t think he is ready yet for The Clash of the Titans, though I really can’t wait until he is. 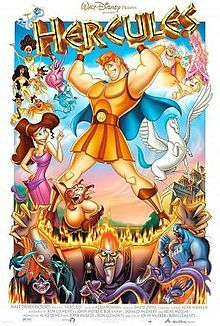 As a really mediocre compromise, I pulled up Disney’s Hercules on Netflix. My wife had beaten me to the classic , so I was left with limited choices. Everyone knows the story: half man, half god, super strong, etc. He wasn’t crazy about it. Frankly, I think the conflict was a bit stressful for him though after the fact he would assert that it was really boring. At least they got Danny DeVito to play Philoctetes, the short fat faun. Other than that, it’s not that memorable. I don’t think 1997 was a great year for Disney productions. BUT, if your child is a fan of mythology, or you want him to become one, this is a nice and easy stepping-stone into the world of folklore and mythology. A couple weeks ago, I read an article about the most expensive home in America, which is currently listed at $190 million. The Copper Beech Farm is a 15,000 square foot, 12-bedroom estate that was originally built in 1897, and is situated on 50 acres of manicured grounds in Greenwich Connecticut. While the home itself is gorgeous, as can be expected of any property of that value, one of its features stuck out for me: a sleeping porch off the master suite. 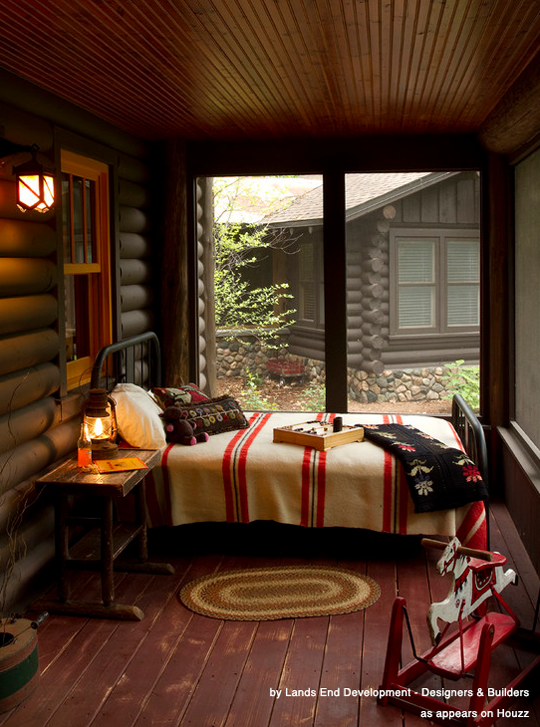 Intrigued, I did a bit of research on whether a sleeping porch is a real thing. 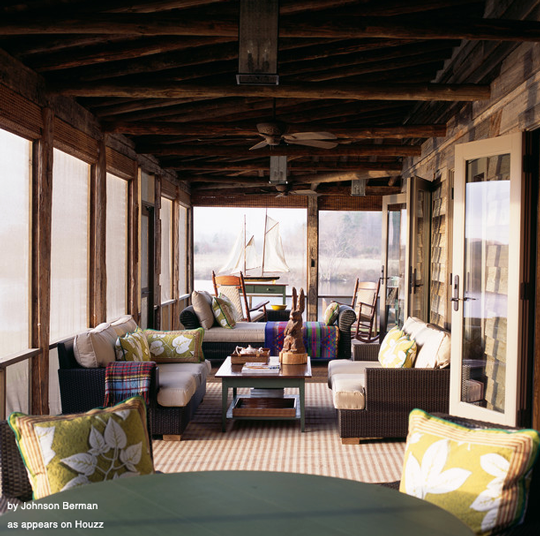 Touted by some as the “ultimate luxury,” sleeping porches first gained popularity at the turn of the 20th century; however, they have been used extensively throughout the world since Roman times. 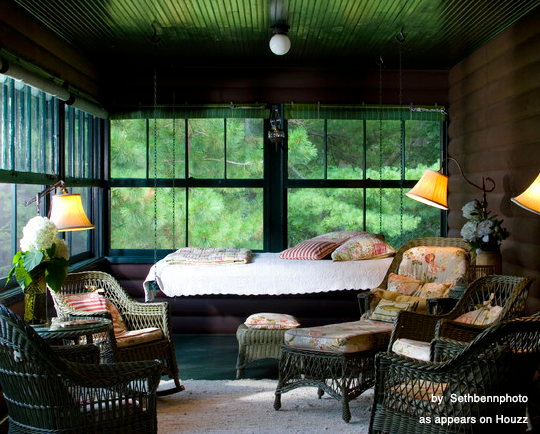 Nothing more than a screened in porch, similar to a modern day sunroom, people used sleeping porches to enjoy the comfort of the cool night air during warm summer months when sleeping inside wasn’t ideal. In addition to being more comfortable than sleeping indoors, people also believed that the fresh air helped with respiratory illnesses and other ailments. This idea was particularly popular as Americans began moving away from industrialized cities to the countryside. Even though most (but not all) homes today have central air conditioning, and some people harbor a a general distrust towards their neighbors, sleeping porches are making a comeback in recent years. Many people are looking for ways to reconnect with nature, or otherwise find it enjoyable to sleep outdoors in the crisp night air. And even if you have central air, a sleeping porch is an eco-friendly way to escape the summer night heat while keeping your electric bill down. Add a rustic porch bed with metal frame with a mosquito net and quilted bedding an you’ve got a charming bedroom retreat for your and your guests. If you aren’t keen on the idea of foregoing all the modern modern comforts you’ve grown accustomed to by sleeping outside, a lot of homeowners are converting what was once a sleeping porch into a cozy and functional sunroom. You could even add a day bed, which is perfect for an afternoon siesta. I’ve got orange on my mind – the color, that is. Warm, vibrant, fiery orange. The color of sunsets and pumpkins and autumn leaves. The color of accents in my sister’s revamped living room. We wanted to surprise Janet with a birthday gift, and got some help from our good friend Luis of Luis Acevedo Interior Designs (http://luisacevedointeriors.com/). Luis created a hip “shades of gray” theme, with jaunty splashes of orange to spice it up. So he sent me shopping. For pillows. Candles. Dishes. Anything I could find that was just the right shade of orange. All that shopping turned my thoughts to food – a vivid, orange birthday breakfast dish. Sweet mandarin oranges turned into a sprightly sauce, spooned lavishly over delicate cream-filled crêpes. Happy Birthday, Janet! Hope you’re loving your new orange-accented room and your vivid, orange breakfast in bed! Place Mandarin oranges and sugar in a small, heavy pot. Bring to a boil, stir, and reduce heat to a simmer. Cook at a bubbling simmer, stirring occasionally, for about 20 minutes until the oranges break apart and the sauce thickens. Keep warm until ready to serve. In a small bowl, mix together cream cheese, sugar, and vanilla. Set aside. In large bowl, mix together flour and salt. Whisk egg into milk, then whisk milk mixture into flour mixture until batter is thick and smooth. Let batter rest a few minutes before cooking. Heat about 1 teaspoon oil in a heavy 6-inch pan over medium heat. When hot, but not smoking, add ¼ cupful of batter to pan, swirling to cover bottom. Cook pancake 1 to 2 minutes until cooked through and lightly browned, flipping once. Keep warm while cooking remaining pancakes, monitoring heat and adding oil as necessary. To assemble, place crêpes on serving plates. Spread each crêpe with 1 to 2 tablespoons of cream cheese filling. Roll up, top with Mandarin orange sauce. Garnish with a few mandarin slices and mint. Serve immediately.